This post seems to be older than 4 years—a long time on the internet. Dated info and offers may no longer apply. Some technical info might be outdated. Please feel free to post a comment with any updated info . Kujichagulia (Self-Determination): To define your business, name your business, create for ourselves, and speak for ourselves! Self determination the process by which a person controls their own life, or so we hope but so many things influence how we think. For some that means “branding”… “my brand” this and “my brand” and a fear of their brand being lost in a collective environment. If we develop strong brands there is no need to fear such. On the other hand a collective is as strong as it’s weakest link. So to truly have collective work and responsibility we need to ensure the individual is well trained and skilled… I thought self determination was fairly simple- but some interesting statements made in social media circles left me less certain. Even more intriguing was the question of applying them to our individual business, community, personal and business life. 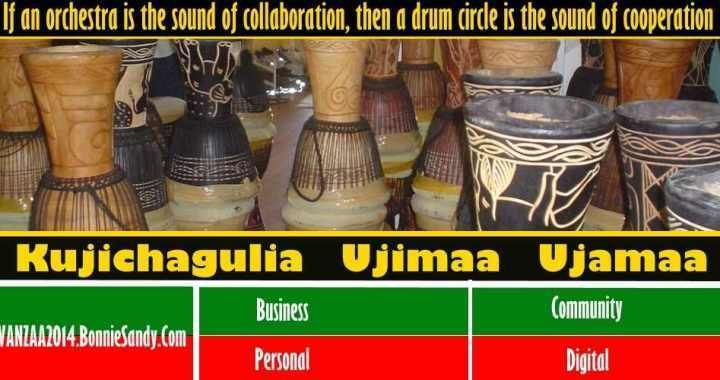 Many are confused with the concepts of Ujima and Ujamaa… Collaboration, collective, cooperative, and collective… and how to integrate them into their Business, Community, Personal but is it. To build and maintain our own stores, shops, and other businesses and to profit from them together. It seems that at the core is an unease, a coming to terms with Ujima (unity) and Kujichagulia (self-determination). These principles are methods of supporting our community… not simply calls to support black businesses or YOUR individual business. An Orchestra is cooperative economics, A drum circle is collective work and responsibility. We do not have a problem pers e with Umoja- unity; or for that matter Újima = Collective Work and Responsibility Collaboration ; or Ujamaa Cooperative Economics. We do not even have a problem understanding the concept of Kujichagulia – Self-Determination. The challenge I see is moving beyond “saying”, voicing them in greetings and fully adapting them in our lives! Just for clarity I decided to check first the principles themselves and then the meaning of each. It is interesting that there were general and legal definitions. This from an article online that explores these terms. Collaboration is people working together (often with a common goal) to build one thing (think wiki page with one understanding). Collective efforts are the aggregation of people’s individual efforts, sometimes in the same service, but do not have common goal or common effort (del.icio.us page for a URL is the collective understanding of individuals tagging of that page for their own use. “the word “cooperative” refers to a specific ownership structure. Cooperatives can be owned by workers, community members, or both. The word “collective” refers to how members participate in the management structure. Collectives manage worker-owned cooperatives, consumer cooperatives, non-profits, or volunteer activist projects. An orchestra is collaborative effort often owned by others, A drum circle is collective work and responsibility usual set in a volunteer organization. Here it is not the legal structure but the the “how”. A drum circle is ustructured, musicians can come and go , join in and break as they feel. Quality of performance, skill rythmn are not important. Participation is. This is about self gratification, expression and giving of ones skill. An Orchestra on the other hand has a set goal. There is common structure, set breaks and each musician is expected to give of his best. Each trains/practices to ensure he/she contibutes to the overall performance. The Orchestra not the individual is the brand that is marketed, sold. and members all benefit via salary, shares or both. A group of independent individuals get together for a specific purpose. Members of that ad-hoc group can decide to beautify a street or host a block party to benefit a cause… a day and time is set ; Partcipants agree on start time, needs are identified and member sign up or show up to contribute informally. Ujamaa that concept can be formalized into a block or community association each member paying “dues” (or investing sweat equity) functioning in set roles and executing in an assigned agreed on manner. Monies raised, causes, action takens, all are agreed and voted on in a structured manner. Ujamaa can evolve as a cooperative cordinated street marketing campaign pulled together by a group of marketers in in the same of across several states. Which is different from an individual’s whose business is marketing creating a muli-client campaign. Kujichagulia The Quest to Define Self Must Proceed – Self Determination! Ujamaa – Is it Simply a word You Recite on December 29th each year! Nia- PURPOSE Is The REASON For Which YOU WERE created or For Which YOU Exists.